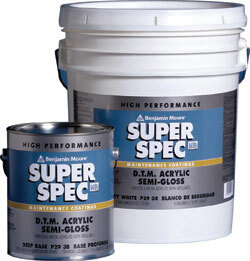 SuperSpec High Performance maintenance coatings are formulated to perform as a direct-to-metal primer and as a semi-gloss finish coat. The water-reducible acrylic does not pose a fire hazard and is non-polluting. It resists various weather conditions, oxidation, fading and loss of gloss. The film provides the adhesion needed to withstand thermal shock, due to radical weather changes. A minimum of two coats is recommended for uncoated ferrous metal.